Please read and adhere to all safety instructions before operating the unit. Keep children and pets away from the machine at all times. Do not leave Children unattended in the same room with the machine. Only one person at a time should use the machine. If the user experiences dizziness, nausea, chest pain and other abnormal symptoms, stop the workout at once.Consult a physician immediately. Use the machine only for its intended use as described in this manual, Do not use attachments not recommended by the manufacturer. Do not place any sharp object around the machine. Never operate the machine if the machine is not functioning properly. Do not use the unit in an environment that is in excess of 37 degrees Celsius or 100 degrees Fahrenheit. Keep the unit away from extreme heat, open flame and water. Only use the unit with the AC power cord supplied with the unit. The AC power cord is not designed to be use with other appliance. Do not allow the electrical cord to come into contact with heated surfaces. Always coil the cords loosely when storing the unit. This unit is designed for home use only. Do not use the product in excess of 20 minutes at one session.allow at least 10 minutes for the unit to cool down in between use. use the massager firmly against the part of the body that you want to work on you can use the massager on the following areas. You should ensure that you have secure and comfortable fit before switching on the unit. 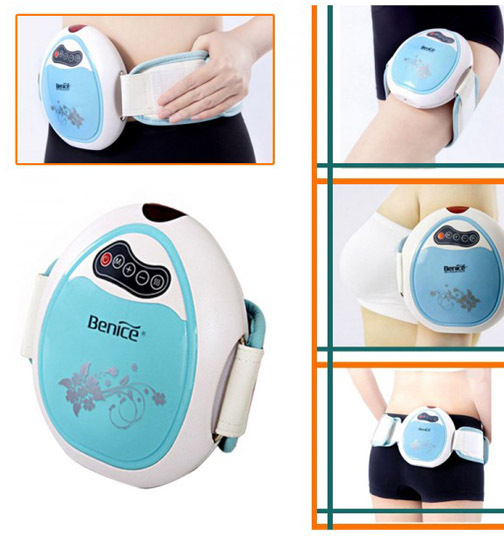 Some users may experience a slight itch after using the machine, it is normal as the body adjust to the effect of the massaging action. Stop using the machine immediately if you feel ill during use. The machine is designed for indoor use only. the recommended maximum duration for use is between 15-20 minutes on any specific area. It is recommended that you only use the machine 1 hour before and after meals. It is recommended that you drink a glass of water to assist in the clearance of toxins after using the machine. It is recommended that you have at least a 2 hour rest in between sessions of using the machine. Do not use the machine when you body is wet. Do not use the machine under the influence of alcohol. Do not use the machine in conjunction with a medical device or electric blanket. Do not use on sensitive skin of if you have a skin disorder. Do not use the unit on you head of areas around the neck. Start by connecting one end of the power adapter to the adapter connector on the machine. Connect the AC power cord to a wall electrical outlet. Wear the massager firmly against the part of the body that you want to work on you can wear the massager on the areas listed on OPERATING INSTRUCTION. You should ensure that you have a secure and comfortable fit before switching on the unit. Once it is connected and power is supplied to the unit, the red light next to the on / off switch will be illuminated indicating that the unit is ready for use. Turn on the machine using the on / off button, it will start on manual mode at the lowest speed.to increase or decrease the intensity, press the increase speed or decrease speed button. To switch to auto mode, press the auto mode button.the auto mode is program to run on a sequence of motions for maximum toning. Should the unit malfunction, please contact your local distributor.